Enjoy the spectacular Christmas lights and holiday movie sites in New York City on this guided bus tour. See some of the best of the Big Apple’s brilliant holiday lights and decorations in all their holiday splendor while visiting one iconic landmark after another, as well as some of the city’s hidden gems. See the exact locations where many holiday movies were filmed, and match them to their on-screen movie clips along the way. This tour is a fun and festive way for the entire family to celebrate the season. This New York City holiday sightseeing tour begins in Manhattan. Hop on your tour bus, and head to Central Park West, home of the world-famous Macy’s Thanksgiving Day Parade and one of the key filming locations in the movies Elf and Mr. Popper’s Penguins. Then it’s on to the Upper West Side to relive holiday scenes from Scrooged and New Year’s Eve before moving on to Lincoln Center for a festive photo op with its beautiful Christmas tree. In Central Park, relive the scenes from Wollman Rink in Home Alone 2 and the Bethesda Fountain in Elf. On the Upper East Side, see the restaurant from Serendipity. Back in midtown Manhattan, remember scenes from Eloise at Christmastime and The Family Man before hitting Rockefeller Center for a viewing of the most famous Christmas tree in New York—as seen in Home Alone 2, Elf, and Noel. 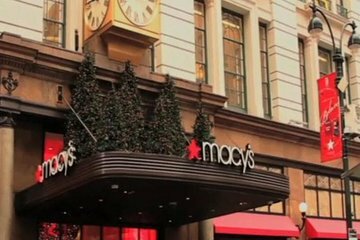 Continue down Fifth Avenue, and find the decorated windows at Lord and Taylor before finishing your tour at the world-famous Macy’s store in Herald Square, home to the “real Santa” in the 1947 Christmas classic Miracle on 34th Street. My friend and I were a little disappointed with this tour. We thought there would be more light displays and more variety of movies featured. Took the tour with 2 kids (11 and 14) and grandma. We all loved it - the holiday scenery was stunning - especially the department store windows. Nice way to see the sights in comfort after a long day of walking around the city. It was fun to see the clips from the movies and match the locations up in real life. It was a Saturday night tour and we did not have the traffic problems that others complained about. All in all I would recommend this tour to others. Great tour! See a lot of NY and different movie locations. Store fronts were amazing. Traffic was so bad that we spent most of the time sitting on the bus waiting. We were re-routed on a couple streets because of high traffic volume. Did not really see many lights, mostly dark streets where a movie was made. Did not live up to expectations. Really a dark bus ride through the city with very little holiday lights. The bus itself was very smelly inside, do not think the tank was cleaned and smelled like an out house. We saw 3 sets of store displays and only 1 had a holiday theme. This tour was basically watching clips of holiday movies filmed in NYC - we really were unable to see any sites in the dark. Only place with lights we saw was driving through Rockefeller Center. Tour guide was nice but seemed very unexperienced. We were all extremely bored and disappointed in this tour unfortunately. My experience with the New York Holiday Lights and Movie Sites Tour was AWESOME!! Max the guide was very witty, kind and knowledgeable and made the tour very interesting. I also appreciate the tour bus driver as he maneuvered through some pretty congested traffic. I highly recommend and have recommended this tour to everyone. The tour guide was knowledgeable but, the tour was disappointing. There was a lot of downtime while the bus driver was stuck in traffic. About half way through they stopped at Bloomingdales to let us off for some window shopping; we had already done that on our own, so we didn’t get back on the bus. Christmas lights and movies on a Saturday night during the first NYC snowfall of winter. The best way to see the most! The elevated view of the lights, storefronts, and thousands of people on 5th Avenue was spectacular. Gingerbread cookies and improv comedy from our guide made the evening. Couldn't fix the traffic jams, but a better check-in system could be! No fun standing in rain for 20min to a half hour. Need to scan physical tickets and allow on busses immediately. That said, exceptional circumstances were in play. Cheers! !